China’s DNA sequencing market is expected to grow to 18.3 billion yuan by 2022 from 7.2 billion yuan last year – much faster than the overall global market because of rising income and growing investments in healthcare infrastructure, studies show. We’ll be welcoming Jay Flatley, the Executive Chairman of sequencing company Illumina as a Co-Chair to the Annual Meeting of the New Champions next month in Tianjin. The increasing property prices and higher labour costs (as well as appealing business incentives from municipal governments) have encouraged many leading companies to move to second- and third-tier cities. According to a recent study of new graduates, 40% of those surveyed hoped to find work in so-called “emerging first-tier cities” such as Chengdu, Hangzhou and Chongqing, versus only 27% who hope to live and work in first-tier cities. In order to promote the industrialization of quantum technology for computing, measurement and telecommunication, China is establishing a national standards commission. China has already pioneered a number of innovations (including the world’s first 2,000km-long line for secure quantum telecommunications and the first quantum communications satellite) but has been lacking official industry standards. As the cost of labour increases in first-tier cities, retail companies are looking to the Fourth Industrial Revolution to solve their home delivery challenges. While we don’t expect robots to replace the thousands of delivery scooters zipping around Beijing any time soon, there are more and more pilot projects of delivery robots and drones in cities – including yellow bots equipped with GPS system, cameras and radar. Innovation in logistics and retail looks set to continue. 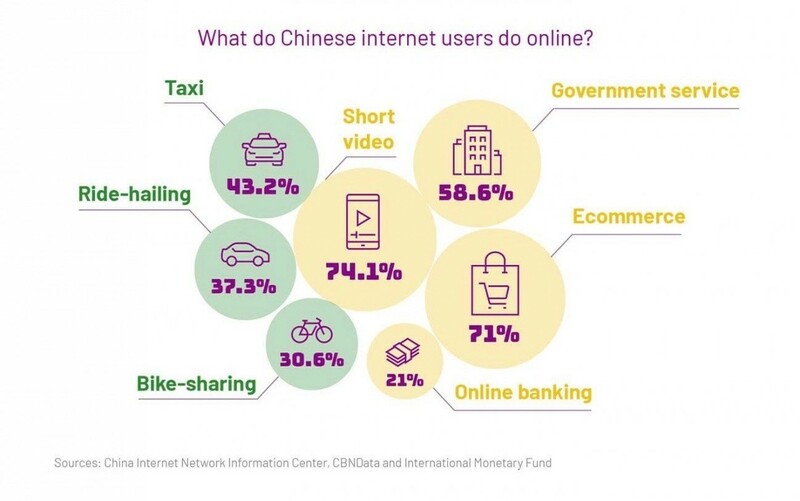 China’s internet population passed 800 million people this month, but another expansion is also under way in terms of making internet access even more inclusive. After five years of pilot testing, China is rapidly expanding the virtual telecom operator business to license 15 companies to resell internet access. The hope is that this move will increase innovation capacity and improve service quality. With 13 new Chinese companies joining the Fortune Global 500 this year, there are 120 companies in the ranking, surpassed only by the US with 126. China continues to push the reform of state-owned enterprises and to encourage their globalization. Can we expect more Chinese companies to join the list in the future? ‹ PreviousSưu tầm – What’s the future of Blockchain?